A new addition to the Sport range in 2011, the 2.0 litre Morgan Plus 4 is now available in the desirable ‘Sport series’ specification. The popular 145bhp two seater features a wider track than its smaller sibling. Boasting superb fuel economy, the Plus 4 sits perfectly between the 1.6litre 4/4 and 3.0litre Roadster in terms of weight, performance and ability. Available in both 2 and 4 seater forms, the lively 145 bhp Plus 4 can be built to an almost infinite number of combinations. 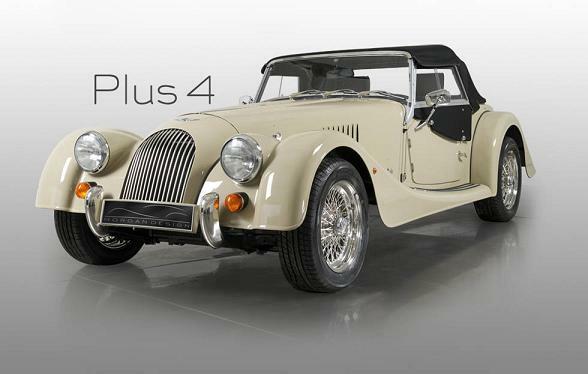 Now, with the wider front track to improve stability, subtly improved dashboard area and cockpit, plus new rear light treatment on the two seater, the Plus 4 remains the mainstay of Morgan productions. On a Bespoke Plus 4 a large range of options are available to make your car truly unique. From virtually unlimited paint choice to an array of crafted detail components each bespoke Morgan is tailored to suit the customer. For further information about available options please contact your local dealer and request the current Morgan Price List.